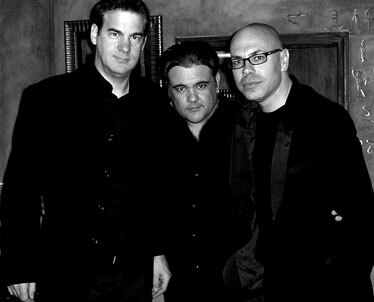 Michael Floreale, left, Rob Juarez and John Ceravolo form the new lineup of When in Rome. It took a movie from 2004 about a teenage misfit from Idaho to help introduce a whole new generation to original, alternative music of the 1980s. Also on the Big Island: 7:30 p.m. Sunday at Hilton Waikoloa Village, $40, call (808)345-3100. That "little movie" would be the independent hit phenomenon "Napolean Dynamite." The late '80s hit song "The Promise" played over the closing credits, and in doing so brought the earnest ballad by When in Rome to the attention of new would-be fans and reacquaint others with the simple but memorable three-chord song. "The Promise," as well as other classic '80s tunes such as "I Ran," "Anything, Anything I'll Give Your" and "Motion of Love" will be heard in all their nostalgic glory again when the Lost '80s Live package tour with A Flock of Seagulls, When in Rome, Dramarama and Gene Loves Jezebel hits the stage of the Events at the Tower (formerly Kapono's) at the Aloha Tower Marketplace. As Michael Floreale from When in Rome said by phone, all four groups run the musical gamut of the decade. While new wave band A Flock of Seagulls may be associated with the early '80s, When in Rome arrived on the music scene in 1989, melding new wave and modern music together. Floreale said songs from the group's earliest days were written in a time of musical innocence. "It was funny times. People were doing things for the first time," he said. "The thing that really excited me were the drum machines. The '90s were a lot more technically savvy and the music was quite interesting. Now it's all about the guitars." But that classic sound has never gone away. A bit of the '80s can be heard in such current bands as The Killers. "They've got a great retro '80s sound in 2007. A bit of the Smiths can be heard as an influence. That's the nice thing about music -- it's all about the influences that affect you." Though Floreale is the lone original member of When in Rome, he still writes new material. But if this new edition of the band is still best known for his song "The Promise," it's something he can live with.
" 'Napolean Dynamite' reached people who hadn't heard it the first time," said the English-born Floreale, now a Dallas resident. "It's a cult movie. That movie is played every Friday in some parts of the country. Coincidentally, the film's producer also lives in Dallas, too." He said that his hit ballad has been played at many weddings, and even a funeral or two. Floreale took a long break from recording his own music and turned to writing commercial jingles and songs for other artists before he was approached to perform shows on the tour Lost '80s Live tour. He and When in Rome has since played some 30 live shows with such fave acts as Devo and the Psychedelic Furs over the past two years. He's in the process of recording new songs for a future When in Rome release next year. When asked if any of his old bandmates will return then, Floreale said he's talked to occasion to Clive Farrington and Andrew Mann, but "they're both out of the business." Floreale said that the upcoming album is just short three tunes, but the reaction to new songs played so far on tour, such as "If Only," has been strong, and have been given the go-ahead by the band's longtime fans of more than 15 years. "There is a bit of edge to it. It's in the When in Rome tradition, it has piano and strings. Hopefully, we get better over time. ... The more sophisticated you become, the more you write. But sometimes good songs can come out of naivete."